Weather takes a swipe at my burger? Oh wait, farmers took the real hit - JP loves LIFE! One of the things folks in agriculture can’t spend enough time talking about is the weather. Good or bad, there is always something to say about it. And with all the technology there is today — 24 hour weather channels, mobile weather updates, etc. its easy to stay up to date. So you may think folks know what’s happening. I think it may be a case of information overload. With so much accessibility of pinpointed information, I think people may be missing the big picture at times. I’m guilty myself of focusing in on where I am or where I am going and occasionally a nice farmer will remind me a sunny day in Memphis doesn’t mean an unexpected snowstorm couldn’t be hitting Nebraska. Awareness of weather on a general basis may improve when a really wide scale event like flooding or drought is reported on the national morning shows and nightly news but I wouldn’t be too sure. And since only two percent of people in the US are engaged in farming, the consequences of weather isn’t always understood or considered. But recently I found a very clear way to get some uptake on the impacts of bad weather — signs at the drive through menu board. Tell Americans that there is a shortage of something they expect to be there even if they don’t think about it. 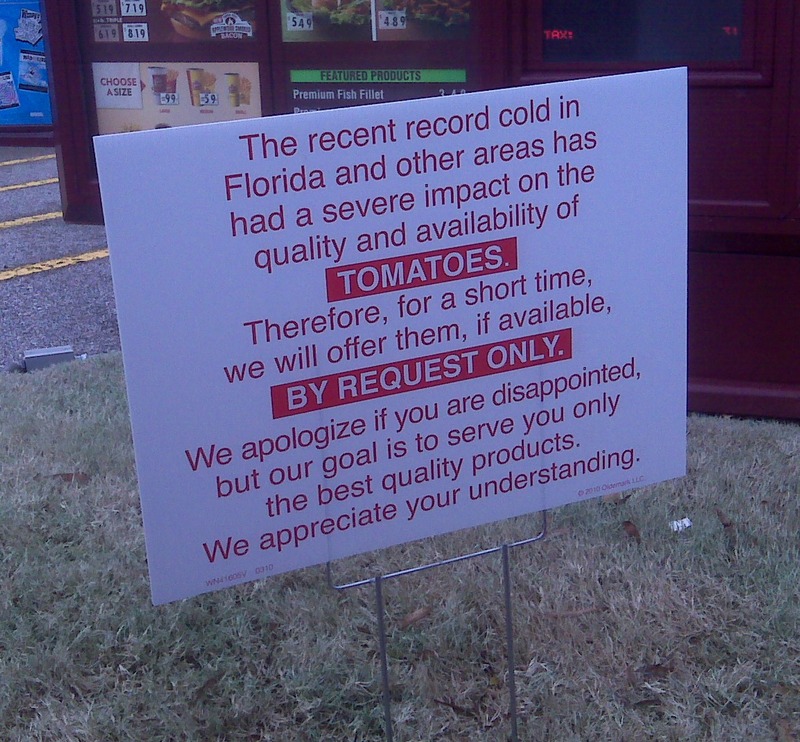 That’s the case with tomatoes right now — check out the sign I saw recently. If you happen to be in a restaurant, grocery store or just having dinner with friends and you happen to hear some comments or questions, maybe you can also take a few minutes to explain the real impact of an untimely frost can really have on family farms. Oh, and maybe we should go buy some tomatoes… I know prices are going up, but they are tasty! If you’d like to keep up with what’s happening on the weather in agriculture, check out weather.com’s farming page. For news and information on the vegetable industry follow Tom Karst of The Packer by blog or twitter. For those on twitter you can also use the FollowFarmer database to find a farmer in a region & check in to see what’s up. I get some of my best info straight from the farm! « My Sister Will SO Call Me a Dork! Hola Ms. Redness – How goes it? Nice post. I actually did exactly what you stated above while at Brookfield Zoo last Friday with my little ones. I asked one of the servers why they weren’t providing tomatoes with the food…she did not know. So I kindly explained while the queue of people behind listened in. I am going to suffer your wrath and plug my company…sorry, but if you are a farmer or work in ag and really want weather data specific to your farm/location by lat/long go to http://www.skybit.com and then ring me at (814) 441-1867. All my best Janice. Have yourself a marvelous week. I JUST saw one of those little signs sitting at a Wendy’s in West Virgina eating ice cream with the kids. First I had heard of the tomato shortage, but know first hand that we are at the mercy of the weather each and every day! No signs like that around here yet, but with such a small town the news that there’s no tomatos at the BK spread like wildfire. Subway’s still dishing them out, though. What irks me is that even the folks around here that should know better, don’t. Even today, I was texting a friend who’s studying hort and they were complaining about this. HORTICULTURE, with a minor in ag marketing. Uh…? Great post, though, JP. It highlights the fact that even though we “know” we aren’t always aware, like my friend. I don’t think we should go buy tomatoes. They’re not in season. You’re not supposed to grow tomatoes in the winter and early spring.